This Saturday at Michael's Wine Cellar! 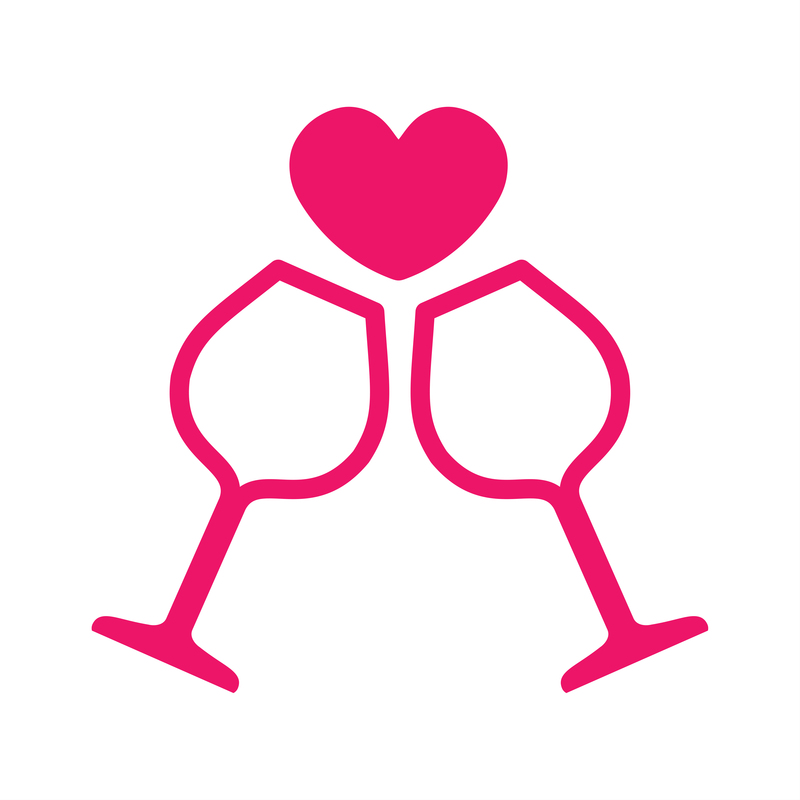 Bring your Valentine along for a relaxing Saturday afternoon together, or stop by to select a select bottle for your Valentine's Day celebrations later this month. February Open House Wine Tasting Saturday, February 6, 2016 2-4 p.m. $10/person Featured Wines: Table 1 Transatlantic Wines Champagne "Brut", Laurent-Perrier, FR, NV Fume Blanc, Dry Creek Vineyard, Sonoma County, CA, 2013 Sauvignon Blanc, Emmolo Winery, Napa Valley, CA, 2013 Shiraz/Viognier, Terlato - Chapoutier, Victoria, AU, 2012 Syrah, Qupe, Central Coast, CA, 2012 Zinfandel "Heritage Vines", Dry Creek Vineyard, CA, 2013 Table 2 LTD Wines Rose "Mourvedre", Babylonstoren, ZA, 2015 Chardonnay “Unoaked”, Lapis Luna, Lodi, CA, 2011 Viognier, Babylonstoren, ZA, 2013 Red Blend "Babel", Babylonstoren, ZA, 2013 Shiraz, Babylonstoren, ZA, 2012 Zinfandel "Romanzo Moon", Lapis Luna, Lodi CA, 2012 Table 3 Noble Wine Malbec “Premium Reserve”, Piattelli Vineyards, Mendoza, AR, 2013 Carmenere “Gran Reserva”, Alcance, Valle del Maule, CL, 2013 Moscato Giallo, LOVO, Colli Euganei Fior d’Arancio, IT, 2014 Table 4 Stacole Fine Wines Albarino, Burgans, Rias Baixas, ES, 2013 Chenin Blanc "Game Reserve", Graham Beck, Coastal Region, ZA 2014 Chardonnay, Martin Ray, Russian River Valley, CA, 2014 Red Blend "Red Jasper", Raats, Stellenbosch, ZA, 2013 Garnacha "Tres Picos", Borsao, Campo de Borja, ES, 2012 Moscato d'Asti "La Serra", Marchesi di Gresy, Piedmont, IT, 2014 Table 5 Southern Wine & Spirits Sparkling "Perle", Ferrari, Trento, IT, 2004 Sauvignon Blanc, Uppercut, North Coast, CA, 2014 Chateauneuf du Pape Blanc, Vieux Lazaret, FR, 2011 Red Blend “Serve”, Honor Winery, CA, 2013 Cabernet Sauvignon, The Divining Rod, CA, 2012 Chateauneuf du Pape “Domaine du Vieux Lazaret", FR, 2012 Table 6 BreakThru Beverage Sparkling "Mirabelle Brut', Schramsberg, CA, NV Vouvray "Sec", Laurent Kraft, FR 2013 Chardonnay "Russian River Ranches", Sonoma-Cutrer, CA, 2013 Cotes du Rhone "Grenache", Dom. Andre Brunel, FR, 2011 Pinotage, Fairview Vineyards, Paarl, ZA, 2014 Cabernet Sauvignon "Estate", Hook & Ladder Vineyards, Russian River Valley, CA, 2012 Table 7 Michael's Wine Cellar Sparkling "Rosa Regale", Banfi Vintners, Brachetto d'Acqui, IT, NV Chateau Marjosse Blanc, Bordeaux Superieur, FR, 2014 Chateau La Prade, Cotes de Francs, FR, 2010 Chateau La Vieille Cure, Fronsac, FR, 2010 Chateau de Chantegrive, Graves, FR, 2009 Chateau Guiraud, Sauternes, FR, 2010 (375ml) No RSVP is required for this casual Saturday afternoon wine tasting, but you are welcome to click here to make online reservations in advance for this Saturday's Open House Wine Tasting. We’re thrilled to announce that Coralie de Boüard of La Fleur de Boüard in Bordeaux will be joining us again in Sarasota for our Forks & Corks Retail Wine Tasting, 3-5 p.m. on Saturday, January 30. Coralie will join more than a dozen international winery owners and winemakers at this special tasting event. Click here to make reservations online. Haven't had a chance to meet Coralie during past visits to Sarasota and Michael's Wine Cellar? Here's some background about her family's winery, compliments of TheWineCellarInsider.com: La Fleur de Bouard is owned by the de Bouard family. When Hubert de Bouard purchased the property in 1998, it was called La Fleur Saint Georges. Following the age old custom of renaming a wine after a change in ownership, they rechristened their new property, La Fleur de Bouard. The de Bouard family are well known for their Bordeaux wine vineyards in St. Emilion, which include Chateau Angelus and Chateau Bellevue as well as their estate in the Cotes de Francs appellation, Chateau de-Francs. Hubert de Bouard purchased the estate in 1998 from a French insurance company. 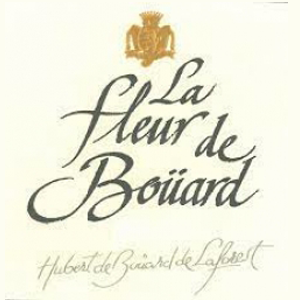 1998 marked the debut vintage for La Fleur de Bouard. However, today Chateau La Fleur de Bouard is managed by Coralie de Bouard, the daughter of Hubert de Bouard. Chateau La Fleur de Bouard sits on the plateau of Lalande de Pomerol in Neac, which is not far from Pomerol. The terroir is clay and sandy soil with a base of gravel underneath. The 25 hectare vineyard of La Fleur de Bouard is planted to 80% Merlot, 15% Cabernet Franc and 5% Cabernet Sauvignon. The vine density is 6,500 vines per hectare in the oldest vines. However, new plantings take place at 8,500 vines per hectare. The average age of the vines at La Fleur de Bouard is 25 years old. However, they have old vines that are close to 45 years of age in their vineyards as well. In 2011, La Fleur de Bouard completed a multi-year reconstruction of their entire wine making making facilities and the chateau, making this one of the most modern estates in the Right Bank. The most striking new feature is their hanging, reverse, stainless steel, conical vats. To produce the wine of La Fleur de Bouard, the grapes go through a pre-fermentation, cold maceration at 10 degrees Celsius and a 3-4 week maceration in stainless steel tanks. Alcoholic fermentation takes place in stainless steel tanks. Malolactic fermentation is performed in a combination of 75% new oak barrels, 15% one year old barrels and 10% takes place in tank. The wine is aged on its lies in 75%, new French oak barrels for between 18-24 months, depending on the character of the vintage. The blend for Chateau La Fleur de Bouard is usually quite close to the planted acreage. Chateau La Fleur de Bouard produces a special cuvee called La Plus La Fleur de Bouard. The grapes come from a small, 2 hectare parcel of very old Merlot vines planted in their clay soils. This high quality, character filled wine is the perfect ringer for a Pomerol tasting. It is the benchmark for any wine from the Lalande de Pomerol appellation. The blend of La Fleur de Bouard as well as that of Le Plus varies depending on the vintage. It ranges from 80% Merlot, 20% Cabernet Franc to almost 100% Merlot. However, for Le Plus, the majority of the time, it’s usually closer to 100% Merlot, while La Fleur de Bouard is closer to the vineyard plantings. There is a second wine, La Fleur Saint Georges. The average annual production for La Fleur de Bouard is close to 7,000 cases per year. 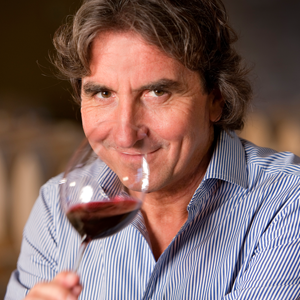 Please join us for a special Italian Wine Dinner hosted by La Spinetta's leading winemaker Giorgio Rivetti. 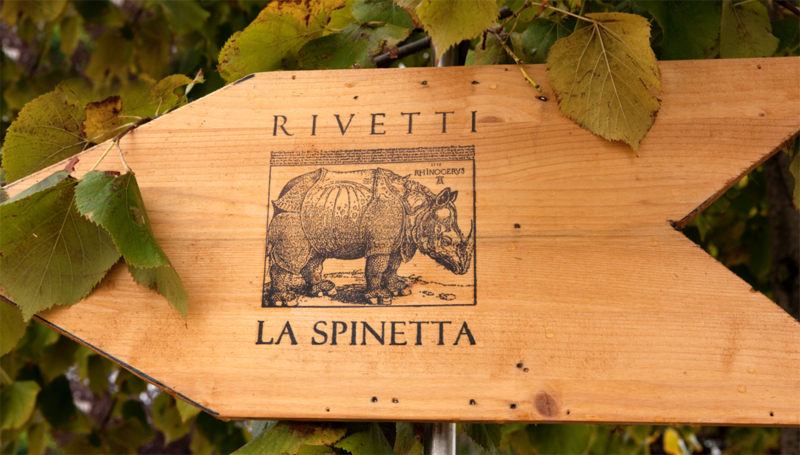 Michael's Wine Cellar will host an extravagant La Spinetta Wine Dinner at 7 p.m. on Wednesday, February 10, 2016. Featured wines will include: Aperitif Vermouth Bianco Cocktail with Lime & Sage 1st course Contratto Millesimato La Spinetta Vermentino 2nd Course La Spinetta PIN La Spinetta Barbera d’Asti “Ca di Pian" 3rd Course La Spinetta Barbaresco “Bordini" La Spinetta Barolo “Garretti" Dessert Course La Spinetta Moscato d’Asti “Bricco Quaglia" Admission is $95 per person, plus tax and gratuity. Space is limited and reservations are required. To make wine dinner reservations, click here or call 941-366-0007, ext. 229. Michael’s Wine Dinners are extravagant, multi-course feasts paired with fine wines from around the world and visiting wine personalities. Our wine specialists select each wine, and our culinary staff creates a menu to complement the intricate layers of the wines. Through the end of January, we invite you to "sip and shop" at Michael's Wine Cellar each Saturday afternoon. 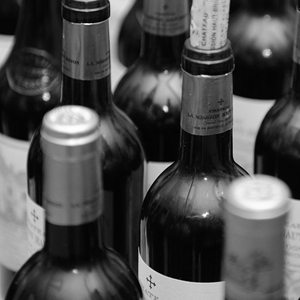 Sip & Shop on January 16, 2016 Chateau Marjosse Blanc, Bordeaux Superieur, FR, 2013 Chateau Marjosse Rouge, Bordeaux, FR, 2012 Bourgogne Blanc “Chardonnay”, Francois Carillon 1611, FR, 2013 Bourgogne Rouge, Camille Giroud, FR, 2013 Sip & Shop on January 23, 2016 Arneis "Blange", Ceretto, Langhe, IT, 2013 Chardonnay "Morino", Beni di Batasiolo, Langhe, IT, 2011 Barbera d'Alba "Reccolta", Bottegaio, IT, 2012 Chianti "Classico", Volpaia, IT, 2013 Of course, on Saturday, January 30, we invite you to join us for Michael's Forks & Corks Retail Wine Tasting - hosted by many visiting winemakers! Click here for reservations. Click here for directions to Michael's Wine Cellar. Regular store hours are 10 a.m. – 6 p.m., Monday – Saturday. For the convenience of shopping 24 hours a day online, simply click here to shop our web store. Each month, Michael's Wine Cellar hosts a casual "Whiskey Club Tasting" offering spirit aficionados and novices alike the opportunity to taste a themed line-up of brown spirits - from Scotch, Bourbon to Rye. We'll be starting off the 2016 calendar with a Whiskey Club Tasting at 6:30 p.m. on Tuesday, January 12 in the Store. 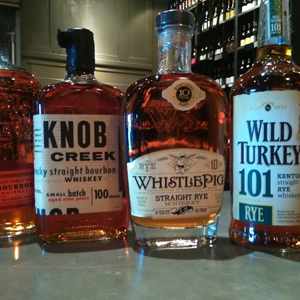 This month's featured spirits will include: Builleit Bourbon Knob Creek Bourbon Whistle Pig Rye Wild Turkey 101 Rye Admission is $10/person. Click here to pre-register online, or simply join us this Tuesday evening! It's hard to believe, but our friend Turner C. Moore is already working on the final touches for this year's Whiskey Obsession Festival! Please join us for the 4th Annual Whiskey Obsession Spirits Festival! 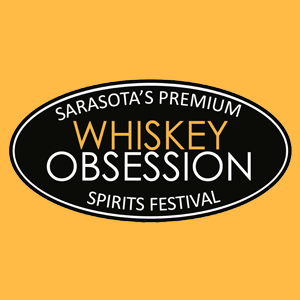 March 31 & April 1, 2016 Whiskey Obsession is one of the largest whisk(e)y shows in Florida, celebrating fine single malt, blended Scotch and American whiskies, Bourbon and rye, as well as whiskies from Ireland, Australia, France, England, and around the world. The elegant grand tasting event allows guests to sample over 200 premium spirits and interact with distillers, international brand ambassadors, importers, and industry professionals. Gourmet appetizers and a lavish buffet complement the selections. Click here for details about festival events and tickets. Save the date! 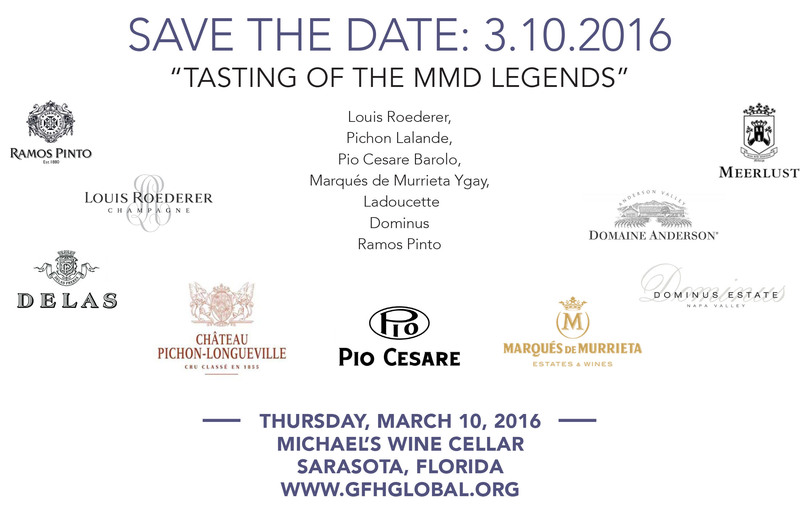 Grapes for Humanity: Tasting of the MMD Legends March 10, 2016 Featuring Louis Roederer, Pichon Lalande, Pio Cesare Barolo, Marqués de Murrieta Ygay, Ladoucette Dominus and Ramos Pinto! Join us for a special “Tasting of the MMD Legends” event hosted by the Grapes for Humanity Global Foundation at Michael’s Wine Cellar. Click here for more details and tickets. Perfect for New Year’s Eve (NYE) celebrations — or any gathering! — the Store offers new “Party Packs” for those seeking no-stress wine selections. Our team has a perfect mixed case of wines ready for any party! 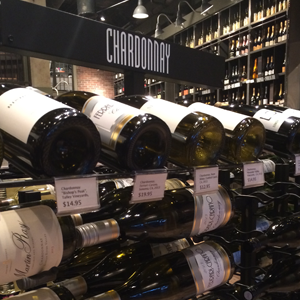 Please see below to browse our wine specialists' no-hassle picks prepared for you this week! 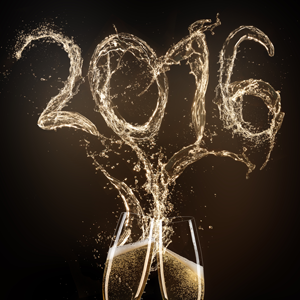 New Year's Best Package $199.95 4 bottles- Sparkling "Mirabelle Brut', Schramsberg, CA, NV $23.95 2 bottles- Chardonnay “Estate”, Alexander Valley Vineyards, CA, 2013 $16.95 2 bottles- Sauvignon Blanc, Bouchard Finlayson, Walker Bay, ZA, 2014 $19.95 2 bottles- Pinot Noir “Postcard Series”, Stark-Conde, Elgin, ZA, 2013 $15.95 2 bottles- Cabernet Sauvignon, The Divining Rod, CA, 2012 $14.95 "Auld Lang Syne" Package $129.95 4 bottles- Sparkling "Brut", Francois Montand, FR, NV $10.95 2 bottles- Chateau Marjosse Blanc, Bordeaux Superieur, FR, 2013 $18.95 2 bottles- Chardonnay, Sean Minor, Central Coast, CA, 2014 $12.95 2 bottles- Chateau Marjosse Rouge, Bordeaux, FR, 2012 $18.95 2 bottles- Cabernet Sauvignon "The First Lady", Warwick, ZA, 2013 $13.95 Stop in the store, 10 a.m. - 6 p.m. to pick up your 12-bottle wine "party pack" for all your NYE celebrations as we ring in 2016! Plus, for your convenience, Michael’s Wine Cellar is happy to offer a courier service for wine, spirits and beer purchases. Contact the Wine Store for complete details: 941-366-0007, ext. 249. Please join us for a South African wine dinner hosted by special guests from this January as part of the popular Forks & Corks Food & Wine Festival! South African Wine Dinner Featuring Babylonstoren & Paul Cluver Hosted by Charl Coetzee, Winemaker, Babylonstoren & Liesl Rust, Paul Cluver, Co-Owner & Sister of Paul Cluver himself! Friday, January 29, 2016 7 p.m. at Michael's Wine Cellar Admission is $95 per person, plus tax and gratuity, and reservations are required as seating is limited. Click here to make reservations online or call 941-366-0007, ext. 229. Babylonstoren Babylonstoren is one of the best preserved werfs (farm yards) in the Cape Dutch tradition. The property includes the manor house from 1777 as well as pioneer structures which date back to the founding of the farm in 1690. The Koornhuis (for storing wheat and hay) and the old cellar are exceptional to see. An ornate fowl house, pigeon loft, leaning bell tower and historic gates embellish a traditional courtyard surrounded by a low, whitewashed wall. Today, Babylonstoren is a Cape Dutch farm with vineyards and orchards surrounded by the dramatic mountains of the Drakenstein Valley. 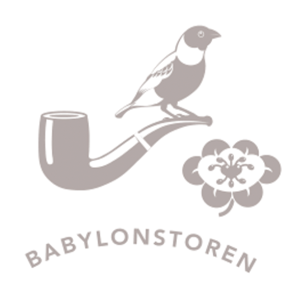 The Babylonstoren logo, which consists of the pipe, representing the farm, the flower, representing the garden and the bird, representing nature, combines the very essence of Babylonstoren and that is keeping things simple and as true to the earth as possible. 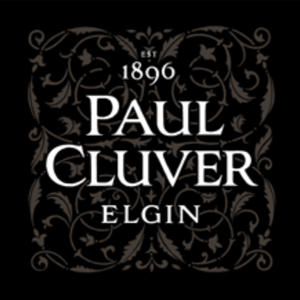 Paul Cluver This family-owned, family-run winery is located in the cool-climate Elgin Valley, approximately 70km southeast of Cape Town. The property has been in ownership of the Cluver Family since 1896. Recognized as pioneers of wine in the area, the family continues to focus on producing elegant wines that are expressive of the terroir. The wine business forms part of larger holistic farming business called De Rust Estate. In addition to the vineyards and cellar, there are apple and pear orchards, a Hereford stud and eco-tourism activities, including amphitheater concerts, on the farm. This estate forms part of the UNESCO world heritage site, the Kogelberg Biosphere. Half of the estate has been set aside for conservation into perpetuity. De Rust is one of the first farms in South Africa to enter into a stewardship contract agreement with Cape Nature. The objective of which is to conserve the pristine habitat on the property in perpetuity by means of provisions attached to the property’s title deeds. The conserved area is in excess of 1000ha, and is now called the Cluver Family Reserve. This reserve includes a game camp for antelope that used to occur in the area. We know how busy your social calendar can be, so we wanted to be sure and share an entire year of fabulous wine tastings and special events at Michael's Wine Cellar! 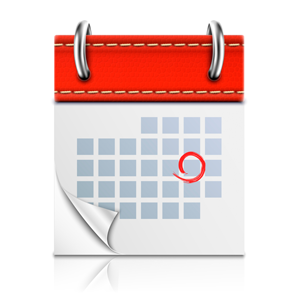 Mark your calendar and join us throughout the year to enjoy some of Sarasota's most popular events. Open House Wine Tastings Michael’s Open House Wine Tastings are offered on the first Saturday of most months year-round, offer a relaxing afternoon and opportunity to discover new favorite vintages among more than 60 fabulous wines! Admission is $10 per persona and advanced reservations are NOT required for these casual, walk-about wine tastings. 2016 Open House Wine Tasting Events Saturday, January 30 - 3-5 pm (NOTE TIME for this Forks & Corks Wine Tasting) Saturday, February 6 - 2 to 4 pm Saturday March 5 - 2 to 4 pm Saturday, April 9 - 2 to 4 pm (PLEASE NOTE DATE CHANGE!) 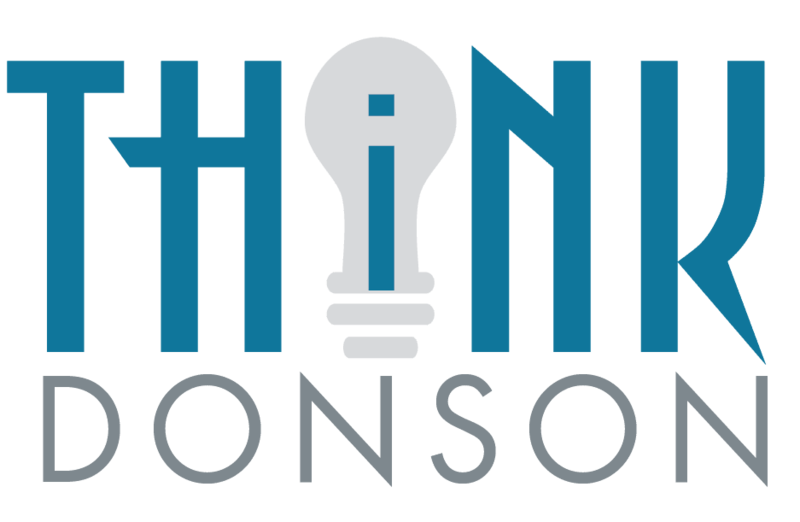 Saturday, May 14 - 2 to 4 pm Saturday, June 4 - 2 to 4 pm Saturday, July 9 - 2 to 4 pm Saturday, August 6 - 2 to 4 pm Saturday, September 10 - 2 to 4 pm Saturday, October 1 - 2 to 4 pm Saturday, Nov 19 - 2 to 4 pm (Holiday Open House & Toy Drive) Saturday, December 10 - 2 to 4 pm (Holiday Open House & Toy Drive) Wine Dinners Michael’s Wine Dinners are extravagant, multi-course feasts paired with fine wines from around the world and visiting wine personalities. Our wine specialists select each wine, and our culinary staff creates a menu to complement the intricate layers of the wines. $95 per person, plus tax and gratuity Reservations are required and space is limited for our wine dinner events. Friday, January 29 – Babylonstoren & Paul Cluver "Forks & Corks" Wine Dinner Saturday, January 30 – Hess Collection & Rombauer "Forks & Corks" Wine Dinner Saturday March 5 – 7 pm Saturday, April 2 – 7 pm Saturday, May 14 – 7 pm Saturday, June 4 – 7 pm Saturday, July 9 – 7 pm Saturday, August 6 – 7 pm Saturday, September 10 – 7 pm Saturday, October 1 – 7 pm (Plus our annual Holiday Champagne Tasting set for 6-8 pm on Wednesday, December 14, 2016!) Whiskey Club Tastings Michael’s Wine Cellar is also pleased to offer Whiskey Club tastings in the Store on at 6:30 p.m. on the second Tuesday of most months. Admission is $10 per person and reservations are strongly encouraged. All of the products tasted will be available for purchase or special order the night of the event. We are thrilled to announce details for the numerous Forks & Corks events hosted at Michael's Wine Cellar, Michael's On East and the Michael's On East Ballroom in January 2016! Some of the most remarkable - and popular - functions include two wine dinner events hosted by visiting winemakers, in town for Forks & Corks! Michael’s Wine Dinners feature extravagant five-course feasts designed to complement a specific winery or portfolio. South African Wine Dinner Featuring Babylonstoren & Paul Cluver Hosted by Charl Coetzee (Babylonstoren, Winemaker) & Liesl Rust (Paul Cluver, Co-Owner) Friday, January 29, 2016 7 p.m. at Michael's Wine Cellar $95 per person, plus tax and gratuity Click here to make reservations online or call 941-366-0007, ext. 229. 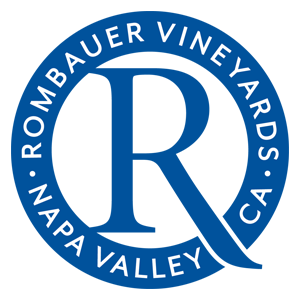 Napa Valley Wine Dinner Featuring The Hess Collection & Rombauer Vineyards Hosted by Kate Ayers (The Hess Collection, Associate Winemaker) & Luke Clayton (Rombauer Vineyards, Winemaker) Saturday, January 30, 2016 7 p.m. at Michael's Wine Cellar $95 per person, plus tax and gratuity Click here to make reservations online or call 941-366-0007, ext. 229. Forks & Corks "Open House" Wine Tasting Also mark your calendar for Michael's Retail Forks & Corks Wine Tasting, 3-5 p.m. on Saturday, January 30, 2016. All are welcome to attend a casual afternoon tasting at Michael’s Wine Cellar in celebration of Forks & Corks. Take advantage of this unique opportunity to meet winemakers and winery owners from around the world, plus, of course, taste the wines that are their true pride and joy! Admission is $10 per person. 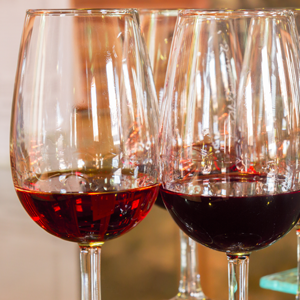 No RSVP is required for this casual Saturday afternoon wine tasting, simply join us at Michael’s Wine Cellar, but please note the time: 3-5 p.m. Click here to make online reservations in advance for this casual tasting event. Forks & Corks University The Sarasota-Manatee Originals are also accepting reservations for Forks & Corks University, an educational program scheduled for the morning and afternoon on Saturday, January 30 this year. Full-day and half-day seminars, including a wine luncheon are available with Michael's On East, Michael's Wine Cellar and the Michael's Ballroom hosting various aspects of each event. Click here for details and reservations to Forks & Corks University. Please note that tickets to the 2016 Forks & Corks Grand Tasting produced by the Sarasota-Manatee Originals sold out in just a few minutes in November 2015. We hope you'll be able to join us for these numerous other opportunities to meet visiting winemakers throughout Forks & Corks weekend including these special events on property at Michael's. In addition to fine wines which make perfect hostess gifts and gourmet gift baskets which are great for those difficult-to-shop for friends and family members on your gift list, a Michael’s On East & Michael’s Wine Cellar gift card is sure to please. 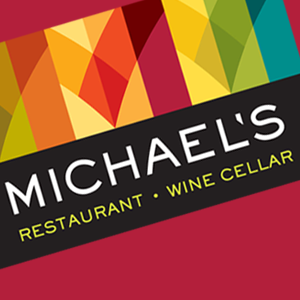 This holiday season give the very best of Sarasota: share the gift of great food, fine wines and culinary culture with Michael’s On East & Michael’s Wine Cellar gift cards. For a limited time, we are pleased to offer a special gift to you: Receive a $20 bonus gift certificate with every $100 gift card purchase! 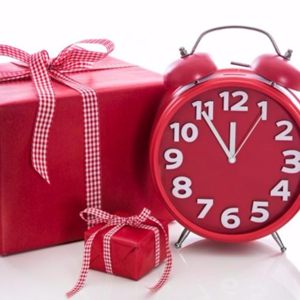 For a limited time only, so be sure to purchase your holiday gifts for clients, family, friends and neighbors today. Click here to purchase gift cards online, call 941-366-0007, ext. 249 or stop in the restaurant or wine shop to purchase gift cards. NOTE: With the holidays quickly approaching, we now recommend stopping in the Store or Restaurant to purchase gift cards. Purchases made before January 15, 2016, qualify for the $20 bonus certificate. When purchasing a $100 gift certificate or more online, there is no need to select an extra checkout option for the bonus certificate. All orders placed on or before January 15, 2016 will automatically include the $20 bonus certificate. The $20 bonus certificate is valid through May 31, 2016. Some restrictions apply. It's time for our most SPARKLING event of the season - and ten tickets are still available for tomorrow evening's Holiday Champagne Tasting. Plus, earn DOUBLE Gulf Coast Connoisseur Club points on any purchase of 6+ bottles of sparkling wines during the event. Tis the season to celebrate with bubbly! Featured Champagnes & International Sparkling Wines: (Just a few of the 60+ Sparkling Wines to be poured tomorrow night!) Champagne "Grand Brut", Perrier-Jouet, FR, NV Champagne "Authentic Brut", Canard-Duchene, FR, NV Champagne "Brut Majeur", Ayala, FR, NV Champagne "Belle Epoque", Perrier-Jouet, FR, 2006 Champagne "Rose", Laurent Perrier, FR, NV Champagne "La Grande Dame", Veuve Cliquot, FR, 2004 Champagne "Brut Reserve", Billecart-Salmon, FR, NV Sparkling "Wedding Cuvee", Iron Horse Vineyards, Sonoma County, CA, 2011 Sparkling "J. Schram", Schramsberg, North Coast, CA, 2006 Prosecco "Zeta Dry", Zardetto, IT, 2012 Cava “Extremarium”, Mont Marcal, ES, NV Click here for reservations for this popular event set for 6 p.m. tomorrow, Wednesday, December 16. Admission is $50 per person. 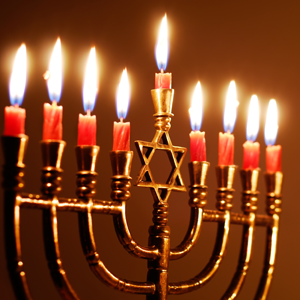 It's time to pick-up your Kosher wines for Hanukkah! Kosher wine is produced according to Judaism’s religious law, specifically, Jewish dietary laws (kashrut). We are privileged to work with the Jewish community throughout the year catering many Jewish organization functions, special Temple events and many weddings offering a Kosher menu, so it is our pleasure to offer several Kosher wines available for retail purchase from our local wine and spirits shop, Michael’s Wine Cellar. Michael's Wine Cellar is currently offering the following Kosher wines: Chardonnay "Kosher", Alfasi, Valle Del Maule, CL, 2012 $9.95 Tasting Notes: Dry, crisp, and well-balanced with hints of apple and pear. Cabernet Sauvignon “Kosher”, Alfasi, Valle Del Maule, CL, 2013 $9.95 Tasting Notes: Full-bodied with flavors and aromas of dark berry and cherry and well integrated oak. 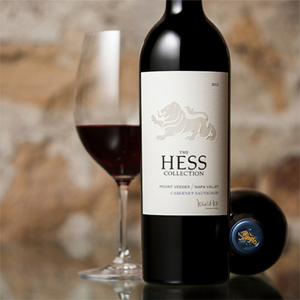 Alfasi is produced by Chilean winemaker Héctor Saldivia. Héctor and his team have achieved several goals in the grape-producing and oenological areas. Their achievements range from obtaining over a thousand planted hectares and developing new wine production lines, to the introduction of new wine making techniques while consolidating the existing techniques. One of the main concerns and responsibilities that Alfasi has as a company is to care for the environment for the future generations. The vineyard is involved in knowing and resolving issues regarding global warming. It is for this reason that Alfasi has taken considerations in the matter and is working to neutralize its carbon dioxide emissions involved in wine transportation by purchasing carbon assets (carbon points) from the specialized environmental company, First Climate Alfasi wines are certified Kosher. Each Saturday through December, the knowledgeable team at Michael's Wine Cellar invites you to stop in the boutique wine and spirits shop to "sip and shop!" Join us this Saturday as we open a few bottles which will make great additions to your holiday shopping list and wine pairings: Chenin Blanc, MAN Family WInes, Coastal Region, ZA Chardonnay "Red Label", Newton Vineyards, Napa, CA Pinot Noir “Estate”, Hook & Ladder Vineyards, Russian River Valley, CA Zinfandel "Sin Zin", Alexander Valley Vineyards, CA Click here for a map to our retail store located at 1283 South Tamiami Trail in Midtown Plaza, Sarasota. Michael's Wine Cellar's regular store hours are 10 a.m. - 6 p.m., Monday - Saturday. For the convenience of shopping 24 hours a day online, simply click here to shop our web store.